Tramadol Cheapest Lynn Baer, DVM, Cat Specialist, shares her top tips for cat owners to ensure well adjusted, happy cats. Lynn says, “happy cats are healthy cats and happy cats make owners happier and healthier, too”. No one expects to find something incredible in their own backyard, but sometimes the unlikely happens. A farmer was making the rounds on his land when he came across creatures unlike anything he had ever seen before. They looked like kittens, but definitely not the domesticated ones he’s seen before. He knew he was going to need some help in figuring out how to save them, so he called the local nature reserve to assist. Here’s what happened. When a Russian farmer went out to check on his land recently, he discovered four odd little animals in his barn. The farmer contact the Daursky Nature Reserve to see what he should do. 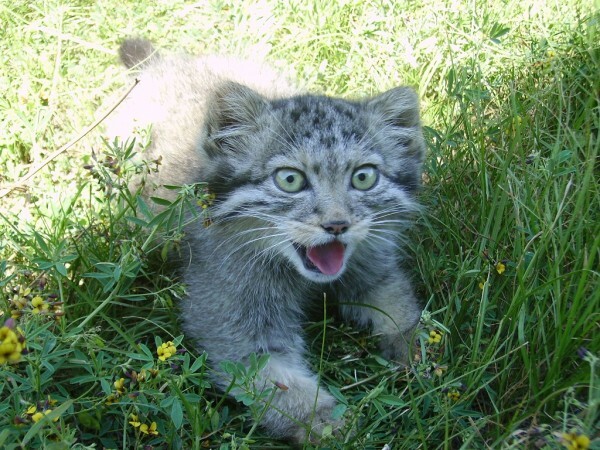 The organization identified the cats as young Pallas’s cats, or manuls, a rare wild breed native to Central Asia! Pallas’s Cats are around the same size as a house cat with a few noticeable differences. Their faces are a bit shorter, they are somewhat stouter than a domestic cat, and their thick fur helps them survive in chilly temperatures. In addition, manuls have wider faces and flatter ears. The reserve thought to have two domestic cats at the facility nurse the baby manuls, and everyone was relieved when their strategy worked! 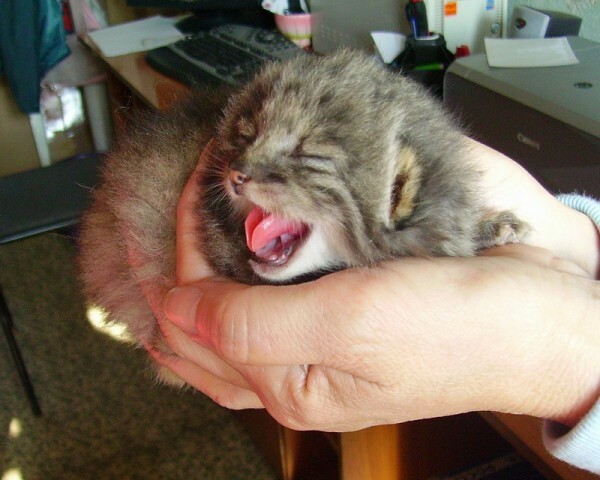 As the kittens grew, the staff at the reserve began to really love the little guys. Since the cats did so well at the reserve, the staff knew it was time to release them back into the wild. A bittersweet goodbye was in order as the adult Pallas’s cats were sent back home. They were tracked using radio collars until winter, when the collars suddenly disappeared. The manuls were photographed a bit thinner than they had been in captivity, which is to be expected. 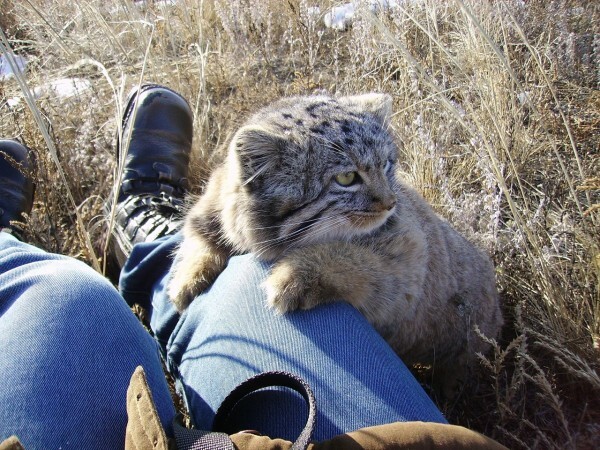 The reserve staff decided to take the cats back to the facility for the winter and release them again in the spring, when the weather would be kinder to the newly wild animals. When they were re-released, the cats were better adjusted to their surroundings and did very well. These days, the manuls found inside that barn are thriving in their native habitat, and it’s all thanks to the man who found them and their caregivers at the reserve. What a lucky day it was for those cats to be found. How wonderful that the effort of a few turned out to be such a success for these rare and beautiful creatures! These cats are lucky they got the nurturing they deserve. Share this post with your friends who love animals! Didga the Cat (supervised by his human, not pictured). OK, so your cat has had his dinner, and is now pleading to you to let him outside, using his most convincing, nagging meowwwwwww. You oblige. 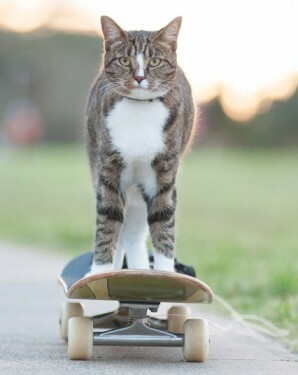 So….what’s your cat’s next move? Any number of potential adventures awaits him. Unless your cat is Didga (see the picture above), I would suspect he is completely on his own, at will to come and go as he pleases. Here are just a few of the many options he has available to him, depending on his environment and the time he spends out there. He finds and chases insects (name your preference); birds; rodents and other wildlife. Keep in mind your cat is not wild, he is domesticated and not created to run wild. However, once his hunting instincts kick in, he would tell you otherwise. If he’s lucky enough (again, from his perspective), he will catch them, play with them, and then consume them, in part or in full. He may even bring the remains, intact or not, to your front door, as his gift to you. Your cat may end up very sick from eating these various vermin, which may cause him and you much distress and cost you a pretty penny at the animal hospital. If he’s fortunate, he will recover. Your cat likes to think that all humans are kind and really, really like him, just like you do. He is trusting. Unfortunately, the world has both kind people and those who are nasty to animals.. Will he lead a charmed life and never encounter any of the nasties out there, while outdoors? We hope and pray so, but it’s not certain. Finally, what happens if the sunny, mild weather suddenly changes into a dark, threatening thunderstorm. Where will your cat go to seek shelter? He may run right home to you if he’s close enough, but that’s not always possible. As for me, knowing my cat might be out there cowering somewhere would really bother me to think about. As you can see, it’s not all sun and butterflies out there. And, as you can tell, we definitely have a bias in this matter, and believe that companion cats should, whenever possible, remain indoors. However, we understand it’s entirely up to you as a responsible and cat loving human, to make that decision. Fortunately, there are plenty of cat toys and safer diversions available for indoor cats. 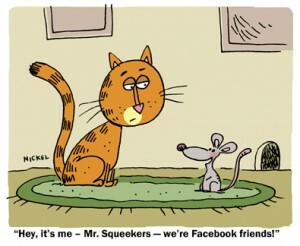 We invite you to go to MyThreeCats.com and check them out!